What is the most successful byond game ever made? I heard NEstalgia at its height made 30,000 usd. But im pretty sure Eternia / Spires beat that already. Id be willing to coin that Fallacy at his height made the most as byond at one point was under his thumb. His lifetime sub alone was pages and pages long. According to Silk, he made six figures a year for a couple years. Tried searching that thread for a link that worked. This data suggests he wasn't lying after all. 20K - 50K owners means (assuming most are full price purchases) that the revenue from the game was between 200,000 and 500,000 USD. It doesn't look like Yut's games have done all that well, this data says they're all "up to" 20K sales but that's a pretty big range considering he could've made anywhere between $0-$200K USD from them each. I think they're really well-made games, it's a shame they didn't really get much attention. Maybe Silk just marketed the hell out of NEStalgia? Seems like it got some reviews from major outlets early on. Just adding more to the thread. 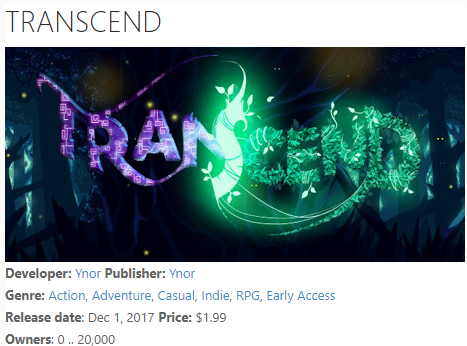 Looks like Transcend hasn't done very well, even with the low price of $1.99 USD and beautiful graphics. 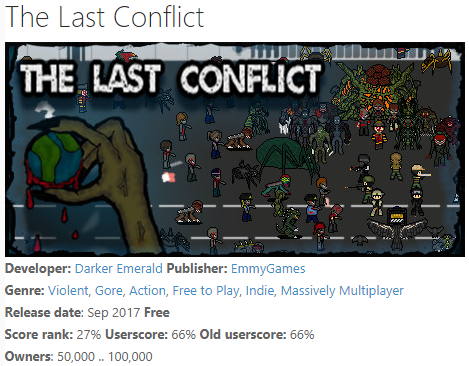 On the other hand, darker emerald's "The Last Conflict" has done even better than NEStalgia in terms of population. The major difference is that TLC is a free-to-play game. I was generally curious of how TLC did after steam. It had like 200 something players after release. Also where did you pull this info of panels and statistics from? SteamSpy is where I got all of that data, it seems pretty accurate. Silk himself said it will probably never happen again. 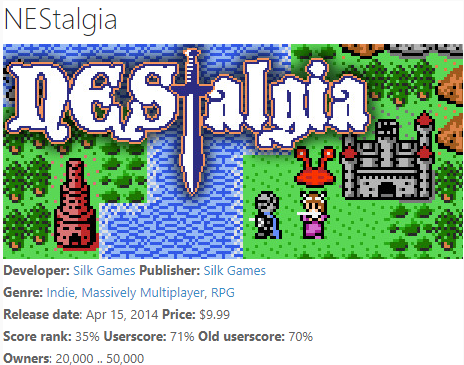 NEStalgia was at the right place at the right time to get a huge number of purchases. That's not to downplay the work Silk did in actually getting his game in front of the right audience.